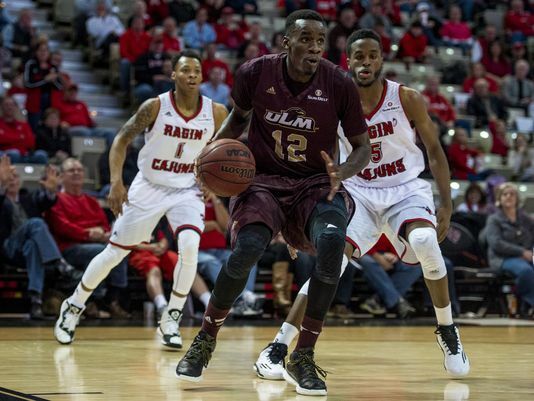 Tyler Ongwae’s college career at the University of Louisiana Monroe (ULM) has come to a close. He has played four seasons in NCAA college basketball, two for Ranger College and two for the University of Louisiana Monroe. Ongwae started all 38 games this season and led the ULM Warhawks in scoring by averaging 14.4 points per game. He also led the team in free throw percentage with 83.6%. He went to the free throw line for 127 attempts, the highest in his team. He gathered the most offensive rebounds on the team with 93 and his rebound average was 6.6, second on the team. Ongwae averaged 3.8 assists per game which was the second highest on the team. This is quite impressive for a person playing the small forward position. He had 37 total steals throughout the season which is almost 1 steal per game, also second highest on the team,. In summary, Ongwae was either first or second on the team in each of the major offensive and defensive categories and was clearly the most valuable player on the team. Ongwae led the ULM to a 14-6 record. ULM has not qualified for the NCAA tournament since 1996 and Ongwae took them to the verge of qualifying. However a one point loss to Georgia State in the semi-finals of the Sunbelt Conference tournament put paid to those efforts. Having missed out on the NCAA tournament, ULM were invited to the College basketball Invitational (CBI). In the opening match, Ongwae scored 26 points as ULM beat Eastern Michigan 71-67. In the quarter-finals, Ongwae scored 27 points as ULM edged Mercer University 71-69. In the semis , Ongwae tallied 22 points as ULM beat Vermont 71-65. In the CBI finals, it was heartbreak for ULM once again. Ongwae scored 15 points but ULM lost 63-62 to Loyola. UILM finished with a 21-12 overall record. This was their 11th 20-win season in school history and the first since 2001-02. The 21 wins are the most since 1992-93. It is also the Warhawks’ 39th winning season in school history and the first since 2006-07. Tylor Ongwae was named to the All-Conference first-team Ongwae became the first-ever ULM student-athlete to earn All-SBC first-team accolades. Ongwae was also named to the all -Louisiana second team. This is no doubt the best over performance a by a Kenyan in NCAA division one basktball. Prior to this, the most accomplished performance by a Kenyan in college basketball was by Peter Kiganya who averaged 19.8 points per game while playing for Abilene Christian University. However Kiganya played in division 2. Also Kiganya left Kenya to play in the USA as a vastly experienced player who had already played several seasons in the kenyan leagues unlike Ongwae who came to the NCAA almost immediately after finishing form 4 and was thus much younger. Where does Ongwae go next? Ongwae stated three years ago that his goal was to make it to the NBA. That is an extremely tall order. But with the statistics he put up this season, he is worth a look. He may not be drafted but he should at least earn an invite to an NBA camp upon which it will be up to him to him to impress the team scouts. The last time a player from ULM was drafted to the NBA was in 2000 when forward Mike Smith was drafted by the Washington Wizards and ended up playing with Michael Jordan who had returned from retirement. Mike Smith was a room-mate of yours truly. Even if Ongwae, does not get drafted to the NBA, he should still have a succesful and fruitful basketball career playing in Europe or South America. Kiganya played most of his professional career in Argentina and Uruguay. Other players of Kenyan descent who currently play in Europe are Omondi Amoke and Robert Nyakundi. Former Maseno product JP Nyadaro plays professional basketball in Canada. This entry was posted in Kenya Basketball News and commentary, Kenya Basketball Players and tagged Kenya basketball, kenya basketball players, tyler ongwae. Bookmark the permalink.